There are many options for stair runners in your house or business. You would pick a design in our showroom. We would come out to your home and measure your stairs and make a template of the stair case. The carpet is binded and the stapled to your stairs so they will not move. Custom stair runners are a beautiful accent for your stairs that people really love. Tile has come a long way in the last 15 years. You do not need to be limited by size, styles or colors. Sizes have changed so much and you can get rectangular tile, 12 by 24 or 9 by 36 tiles. There are also all sizes and types of accent pieces for the kitchen and bathroom. Wall tile and backsplashes come it all sizes,designs and colors! 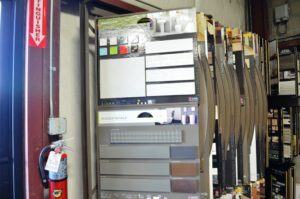 You can get tile that looks like metal, wood, glass or just about anything. The options are almost limitless. Tile is the most durable product for your home and it is very hard to damage and depending on the type of tile it can outlast the home owner! There are so many designs and styles of Wall tile for showers and sinks. 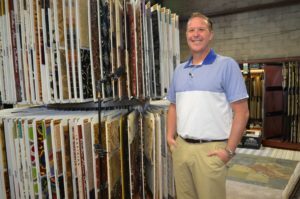 You will most likely want to come into our showroom to check out all of the options that are available. Be sure you make an appointment as our showroom is by appointment only.